During BMA-NJ's Rebranding 360: An Integrated Approach by Mack-Cali, Ilene Jablonski, vice-president of marketing for Mack-Cali, the largest REIT in New Jersey, described the different elements she and agency partner Gigante Vaz Partners implemented in support of Harborside. What makes this case study example stand out is that is goes beyond promoting office buildings or rental units. Instead, it is about celebrating how hip,vibrant and convenient the Jersey City location is, highlighting how attractive that is to a millennial workforce and connecting with TAMI (i.e., technology, advertising, media and information) firms looking for the kind of workspaces Harborside offers. Ilene Jablonski (@ilenejablonski ) began her career with Mack-Cali in 1999. She's responsible for all of Mack-Cali's marketing and public relations initiatives, including advertising, social media, SEO, events, tenant and community relations, digital media, and web presence, as well as the various functions related to supporting the company’s leasing efforts. In addition, she oversees corporate communications for the Company’s multi-family subsidiary, Roseland which Mack-Cali recently acquired. You'll also find her deeply immersed in all things Jersey City - which makes her highly attuned to the benefits of collaboration. Jersey City: Not Another Financial Center. Rather, A Vibrant Cultural Place To "Be Here Now"
The integrated approach Mack-Cali took for Harborside included a powerful campaign - Be Here Now - that infuses every aspect of communications, from the website, to the 15 second video introducting Harborside, to brochures and handouts, and more. Harborside is competing against Brooklyn and the Bronx. 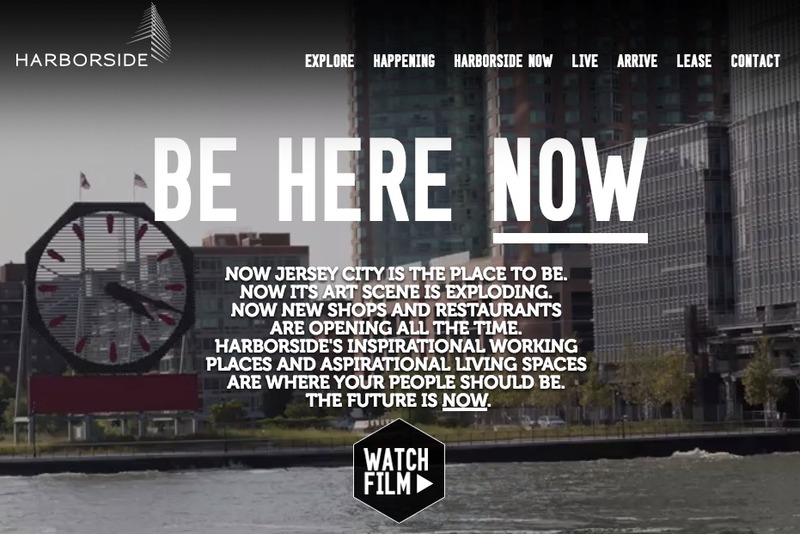 To raise awareness for all that Harborside has to offer and attract businesses (and their workforce), notice how much Be Here Now focuses on Jersey City, its art scene, its unique culture and resources. As you can see from Arrive in Harborside, access is convenient from a range of locations. Harborside includes different types of work properties - some more attractive to TAMI firms and others more traditional in layout. Harborside has received wired certification by WiredScore for its tech infrasture. As a result of the Roseland, Harborside includes a dramatic and new living concept called URL= urban ready living - a "total rethink of how we work, live, play." The integrated marketing approach includes not just video, but also Instagram, Facebook, Twitter and Pinterest. This means focusing on the Harborside editorial calendar every 2 weeks to stay fresh and focused on what matters. According to Ilene Jablonski, advertising for Harborside is 99% digital with an occasional print ad. The focus for visibility has been on NJ.com, TimeOut, and Network Buys. Email blasts focus on communicating the benefits of Harborside to brokers and driving them to the website where they will find plenty of valuable information. An invaluable tool for communicating Be Here Now has been testimonial videos sharing the perspectives of local businesses. These are people who chose to move to Jersey City. Check out Explore Harborside for a real taste of Jersey City via several "Jersey City Stories" videos. Jablonski mentioned several branded content buys - 30 minutes shows - again to showcase local Jersey City stories as well as Talkin' Jersey City with Laura Smith. The opportunity to collaborate and partner with tenants, and interweave the Harborshide message has been invaluable. Overall, the signage and collateral gets people excited. And the collaborative 24/7 events calendar on the site highlights all that makes Jersey City unique and makes the website a magnet for those seeking information about the area. How Would You Apply This Marketing Case Study Example to Your Business? Collaboration is powerful for making a marketing story come to life. Ultimately, it makes for richer, less self-interested stories. In the case of Harborside, shifting from a product-focused message to one about the richness of living in Jersey City - brought to life through Jersey City Stories - is beyond compelling. I want to go there. I want to experience the shops and the culture and the scene that exists there. Don't you? >> See Planning a Customer Event? Add Social Media and Make It Social! for a related concept. How might you apply collaborative and integrated marketing case study examples such as this to your business? How might you make your expertise shine through the perspectives of others in your space? Let me know in the comments.